For Anna Chiu-Chiles, good things seem to come in threes. Over the past six months the fashion designer and co-founder of Kamperett opened a new, sun-drenched flagship store and studio in San Francisco’s Mission District, launched the brand’s seventh collection—a flouncy and flirty reimagining of their beloved, elegant silhouettes—and announced that she will be welcoming another baby boy, her third, in May. With both family and her fashion brand in major growth mode, we needed to know what items Chiu depends on to keep organized, stylish, and sane. 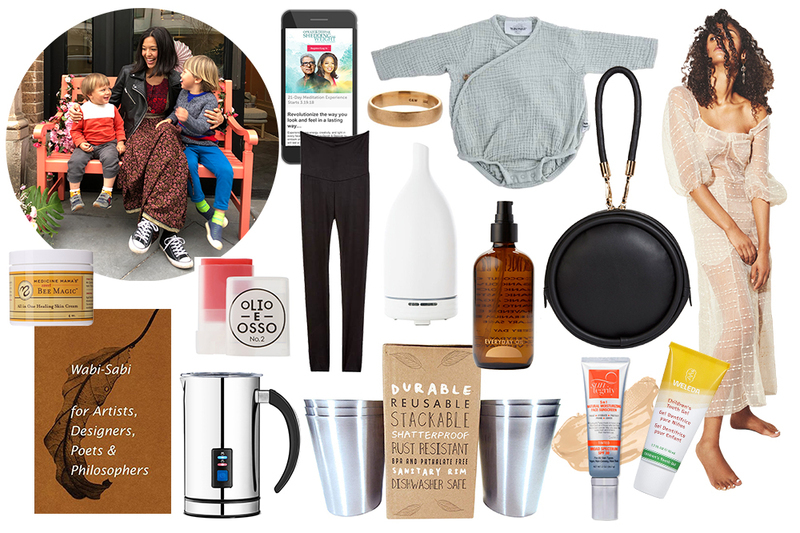 Below, the inspiring mama breaks down her current Mother Essentials for us. Bee Magic. “An all-in-one healing skin cream that I have been using for everything—as a lotion, lip balm, eye makeup remover, etc. I have one in my purse, by my bed at night, and in the car.” Medicine Mama’s Apothecary Sweet Bee Magic, $20.61, Amazon. Wabi Sabi. “I love this simple—and short because I don’t have much time to read!—book about the beauty in imperfection.” Wabi Sabi for Artists, Designers, Poets & Philosophers, $12.29, Amazon. Milk Frother. “The easiest way to add a little luxury to your mornings. This device perfectly froths milk for your coffee or espresso and is super easy to use and clean.” Chef’s Star MF-2 Premier Automatic Milk Frother, $39.99, Amazon. Olio E Osso Tinted Balm. “This is one of the 3 beauty products I use daily. I use it on my cheeks and lips to add some color to my face.” Olio E Osso Tinted Balm, $28, Credo Beauty. Maternity Leggings. “If you are pregnant, you need these! I wear them way too much and I’m sure I will keep wearing them post pregnancy, too.” Storq Signature Leggings, $60, Storq. Meditation. “I try to meditate every night before bed and often I’ll do a guided meditation. I really like Deepak Chopra’s voice and words. You can find some of his guided meditations here. He and Oprah also do great guided meditations together that you can download on their app.” 21-Day Meditation Experience App, free, iTunes. Metier. “Metier is my favorite jewel box of a shop in Hayes Valley. It’s known for the most stunning vintage and modern jewelry out there. I lust after so many of their pieces and I recently got a thick gold band from the shop that I love so much and have not taken off since I got it.” Gillian Conroy 18k Matte Men’s Yellow Gold Classic Band Ring, $1,675, Metier. Saje Diffuser. “My sister got this for me for Christmas and I’ve been using it almost everyday since. It makes the house instantly feel more calm and I love trying out different essential oils.” Saje Aroma Om Ultrasonic Diffuser, $89.95, Saje. Stainless Steel Cups. “I love these dishwasher safe, eco-friendly, BPA- and phthalate-free cups that are a good size for toddlers and kids.” Hudson Essential 7 oz. Stainless Steel Cups, $19.99 (for a Set of 6), Amazon. Everyday Oil. “This oil smells so good and I use it all over! I feel like I’m constantly washing dishes and cleaning, so I can never have enough oils and lotions laying around.” Everyday Oil Mainstay Blend, $48, Amazon. Over The Ocean. “My favorite online shop for kids that carries the most beautiful selection of European baby and kids clothes and toys.” OverTheOcean.com. Hozen Bags. “My favorite vegan leather handbag line. They are super versatile, chic, and ethically made in L.A., and go with every outfit.” Hozen Bags, $180–$320, Hozen. Suntegrity Tinted Moisturizer. “I am currently using this tinted moisturizer and love it. It’s hydrating, lightweight, provides some coverage, and has SPF.” Suntegrity Tinted Moisturizer, $45, Credo Beauty. Weleda Children’s Tooth Gel. “We found this originally in Germany, but it is available on Amazon, too. I like that it is all natural and safe, since my kids typically swallow more toothpaste than they spit out.” Weleda Children’s Tooth Gel, $14.99 (for a 2-Pack), Amazon. Kamperett Rooftop Dress. “We are launching our new Volume 7 Spring/Summer collection in a few weeks, which we are very excited about. The sheer Rooftop Dress is one of my favorite pieces that feels airy, fun, and effortless to wear.” Kamperett Rooftop Dress, $675, Kamperett. Anaise. 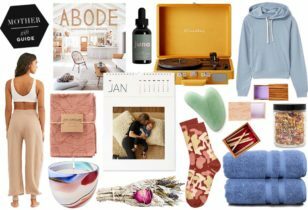 “One of my favorite online shops—for gifts and for myself—that has so many beautiful and special things.” ShopAnaise.com. For more on Anna and Kamperett, check out her personal Instagram feed and Kamperett’s feed, as well. You can also peep her Mother Stories profile from 2016 right here. 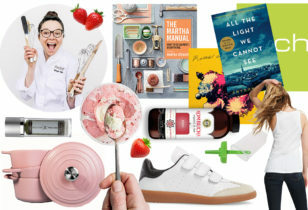 And for more Mother Essentials, peep our past columns with artist Kindah Khalidy, jewelry designers Lauren Godfrey and Maggie Gavigan Smith, Oakland retail queen Sherri McMullen, PR pro Priscilla Vega, Shahidah Zareef of Bossmom Nation, Joanne Encarnacion, LaTonya Yvette, Morgan Walker of Make.do, Jeanne Chan of Harlow & Grey, and more.